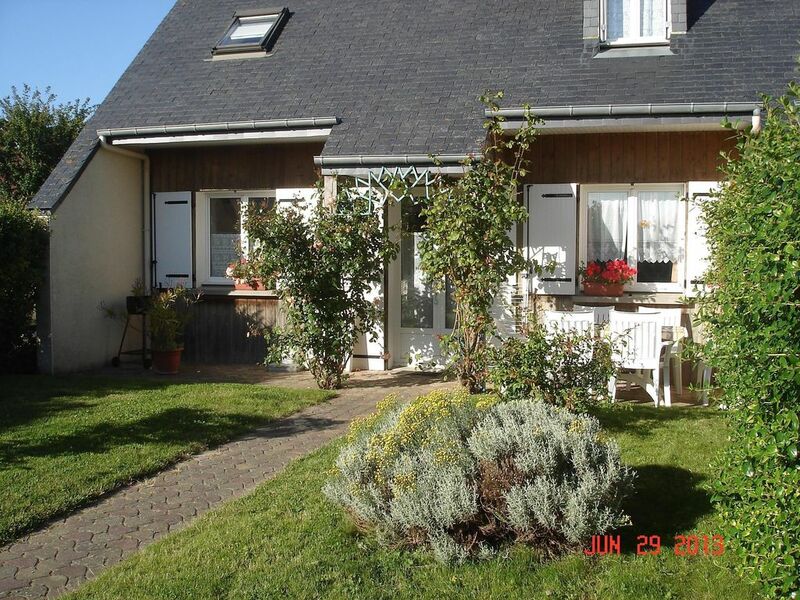 House located in CHERRUEIX (bay of Mont St Michel), built in 2005 in a very quiet place with a private swimming pool 15m x 7m heated to 28 ° open from 15 June to 15 September, to share with two other cottages and we same owners, deckchairs at disposal of the customers. CHERRUEIX (bay of Mont St Michel) very quiet old village of sinners or is a huge sandy beach where you will practice from 7 to 22 July 2012 the international championship sail craft, outside of these dates the club noroît welcomes you to learn how to control these small cars for the fans thrills, Today CHERRUEIX lives mussel (mussel mussel 12,000 tons of annual production) guided tour opportunities mussel and would sin based on hours of tides with the train departure CHERRUEIX marine station, it also saw the culture market garden carrots, leeks etc. entr'autre garlic (annual fete in July), while out of the village along the coast towards St Malo you past old mills that were used to grind wheat in the old days (visit possibibilitée of mills to CHERRUEIX) then on the side of the road as you enter the place called 'The Laronniére common CHERRUEIX of two oyster producers right and left sales to individuals. Le Vivier Sea mussel Port paired with CHERRUEIX or go to the amphibious boats flat-bottomed aluminum fishing for mussels in the bay of Mont St Michel .After ten miles always leaving the sea on the right you will come to light the place called 'red door' turn right towards Cancale harbor, marine farm (museum of oysters) stop in the parking lot to contemplate the port of Cancale with its oyster beds expected to go at low tide then return to Cancale taste if you feel like it oysters on the harbor. see also market .JOUR horse foot on Sunday morning .Ressortir of the city towards the tip of Grouin stunning views, opposite the island you have to birds always along the sea to St Malo you will have several beaches including the beach .On Orchard St Malo to visit the port (often there are boats to visit) .All the ramparts along the coast you will pass on the barage rancid (Central Electricity Company The water-) possibilitée tour stop in the parking lot. Head towards Ploubalay at the roundabout turn right towards St Lunaire, St Briac arrival beautiful scenery PLOUBALAY .If you want to restore you in front of the church to the PMU bar restaurant money very well on her lunch worker amélioré.Revenir not towards CAP Freel, FORT Lalatte and pink granite coast .A also visit the DOL OF BRITTANY Cathedral 8 kms from CHERRUEIX out of DOL take direction RENNES left you will find the menhir CHAMPS DOLENT after 14 km you tuck in COMBOURG visit the chateau where the writer was writing his memoirs CHATEAUBRIAND .Continue towards Rennes 15 kms HEDE to enter the museum 11 locks and stroll along the canal to see the boats go by. If your time allows you RENNES up, leave your car outside in the parking lots and arranged to take the metro towards the city center .Post by Yves st street tourist office to know the hours of guided tours of the old town timbered houses street Chapter, rue Ste Melaine apsalette the street, the Parliament of Brittany, Thabor wonderful gardens with its rose garden, instead of the lists with its old buildings to the covered market that takes place every Saturday morning, museums etc. In contrast we return to CHERRUEIX to take direction PONTORSON to access the Mont St Michel now leave the car in the parking lot with a slight increase in prices compared to 2011. Take the shuttle not bring them to the foot of mount you'll still have a bit of walking to do. I ask you if you want to visit the Mont St Michel smeared to go in the morning to be output to 13 h / 14h as the buses arrive more and more in the afternoon. Leaving from Mont St Michel in Normandy you can direct you to AVRANCHES where you will find sandy beaches on CAROLLES / JULLOUVILLE management GRANVILLE with its port and its fish market .If you are in the area make a detour THE VILLEDIEU POELES artisan town of copper objects and the bell foundry. THERE are a lot of things to discover in our region .I wish you happy holidays and can be with us soon. CHERRUEIX (bay of Mont St Michel) ancient village of fishermen and quiet is a huge sandy beach where you will practice from 7 to 22 July 2012 the international championship sail craft, outside of these dates the club noroît welcomes you to learn how to control these small cars for the fans thrills, Today CHERRUEIX lives mussel (mussel mussel 12,000 tons of annual production) possibilitée guided tour of the mussel beds and fisheries based on hours of tides with the train departure CHERRUEIX marine station, it also saw market gardening carrots, leeks etc. entr'autre garlic (annual festival in July), outgoing in the village all along the coast towards St Malo you past old mills that were used to grind wheat in the old days (visit possibility of mills to CHERRUEIX) then on the side of the road as you enter the place called 'The Laronniére common CHERRUEIX of two oyster producers right and left sales to individuals. Le Vivier sur Mer harbor mitylicole paired with CHERRUEIX or to leave the amphibis boats flat-bottomed aluminum fishing for mussels in the bay of Mont St Michel .after fifteen kilometers always leaving the sea on the right you will come to light the place called 'red door' turn right towards Cancale harbor, marine farm (museum of oysters) stop in the parking lot to contemplate the port of Cancale with its oyster beds expected to go at low tide then return to Cancale taste if you feel like it oysters on the harbor. see also market .JOUR horse foot on Sunday morning .Ressortir of the city towards the tip of Grouin stunning views, opposite the island you have to birds always along the sea to St Malo you will have several beaches including the beach .On Orchard St Malo to visit the port (often there are boats to visit) .All the ramparts along the coast you will pass on the barage rancid (Central Electricity Company The water-) possibilitée tour stop in the parking lot. Head towards Ploubalay at the roundabout turn right towards St Lunaire, St Briac arrival beautiful scenery PLOUBALAY .If you want to restore you in front of the church to the PMU bar restaurant money very well on her lunch worker amélioré.Revenir not towards CAP Freel, FORT Lalatte and pink granite coast .A also visit the DOL OF BRITTANY Cathedral 8 kms from CHERRUEIX out of DOL take direction RENNES left you will find the menhir CHAMPS DOLENT after 14 km you tuck in COMBOURG visit the chateau where the writer was writing his memoirs CHATEAUBRIAND .Continue towards Rennes 15 kms HEDE to enter the museum 11 locks and stroll along the canal to see the boats go by. If your time allows you RENNES up, leave your car outside in the parking lots and arranged to take the metro towards the city center .Post by Yves st street tourist office to know the hours of guided tours of the old town timbered houses street Chapter, rue Ste Melaine apsalette the street, the Parliament of Brittany, Thabor wonderful gardens with its rose garden, instead of the lists with its old buildings to the covered market that takes place every Saturday morning, museums etc. In contrast we return to CHERRUEIX to take direction PONTORSON to access the Mont St Michel now leave the car in the parking lot with a slight increase in prices compared to 2011. Take the shuttle not bring them to the foot of mount you'll still have a bit of walking to do. I ask you if you want to visit the Mont St Michel smeared to go in the morning to be output to 13 h / 14h as the buses arrive more and more the afternoon. Leaving from Mont St Michel in Normandy you are you can head to AVRANCHES where you will find sandy beaches on CAROLLES / JULLOUVILLE management GRANVILLE with its port and its fish market .If you are in the area make a detour THE VILLEDIEU POELES artisan town of copper objects and the bell foundry. THERE are a lot of things to discover in our region .I wish you happy holidays and may be soon to us. Swimming pool heated to 28 °, open from 15 June until 15 September .It measures 7m wide, 15m long, 15m depth 1. 1. 5m ATTENTION 'children will be under the responsability of .Des chairs Parents are available around the pool. Lovely location, pool was fantastic. La maison est confortable et conforme à la description. Très bien équipée et le wifi fonctionne à merveille. Endroit calme à recommander. Merci beaucoup pour votre commentaire , nous essayons de faire le maximum pour notre clientèle , n'oubliez pas si vous êtes dans le coin de nous faire un petit coucou , la porte reste ouverte surtout avec des gens sympathiques et souriants comme vous . Bonne continuation pour l'avenir . Merci encore Astrid et Olivier de vos commentaires , nous essayons de faire le maximum pour satisfaire notre clientèle surtout avec vous dès les premiers contact nous avons accueilli des gens simples ,sympathiques et naturels avec une ouverture d'esprit et de dialogue comme j'aime . Comme je vous l'ai dit le jour de votre départ la porte reste grande ouverte , n'hésitez pas à venir nous faire un petit coucou , ça nous fera un grand plaisirs . N'oublions surtout pas Enzo mon copain , un gros bisous car depuis qu'il est parti je suis seul à manger les framboises . Amitiés .A bientôt . Jean Paul et Paulette . Très bon acceuil. logement simple et suffisant. maison au style rustique et bien équipée. bon état général mais avec le temps, certains équipements seront peut être à revoir. la piscine est très appréciable et bien dimensionnée au vu du partage entre 3 logements et elle est chauffée. le wifi est bien présent mais aléatoire. les propriétaires sont accueillants et de bons conseils. situation géographique fidèle à la description et idéale pour visiter toute la baie du Mont Saint Michel. ne pas rater St malo intra muros, Cancale et ses huitres, le Mont St Michel et son abbaye (à faire le matin! ), mais aussi Dinand et le barrage de la Rance. Bonne semaine en famille !